All of the things we choose to prioritize, ponder and pursue form us in small ways each day. As Christians, we affirm that our identity in Jesus Christ is the center of our Christian formation. The Bible teaches that the Holy Spirit is continually at work in his people (prodding, encouraging, convicting), transforming them into the likeness of Christ. The Spirit’s work in the midst of our participation increases our understanding of the grace of God and growth as disciple of Christ. As Christ’s love transforms us, we participate in our spiritual growth through the practices we do each day, the community we commit to, and how we live out our callings. None exist in isolation from the others, but they are all necessary for well-rounded spiritual formation. And none are independent of God’s active participation, as if these means work on their own. Empowered by the Spirit, they are the basic pattern of Christian growth. Worship: Worship is the attention we give to what we love most. When we intentionally place our affections on God through the practice of worship, we cultivate a love for him above all else and displace lesser loves in our daily lives. Devotion: Devotion is regularly listening to God speak to us in Scripture and responding personally to him in prayer. The practice of daily devotions cultivates an ongoing awareness of and dependence on God in every moment of life. Hospitality: Hospitality is regularly inviting people, especially those who are different from us, into our lives through the sharing of time, attention, and resources. The practice of hospitality cultivates a posture of humility, openness, mutuality, and welcome. Accountability: Accountability is building active friendships where we are responsible to challenge, support and pray for one another. These friendships are honest about our life with God and our personal struggles, encouraging mutual growth. Rest: Rest is God's gift of weekly rhythmic rest. It is given for our delight and meaningful communion with God. Sabbath is a way to trust in God’s provision. By ceasing from work, we are regularly reminded that our identity is not in what we do or achieve. Are you incorporating devotion, worship, accountability, hospitality and rest into your everyday life? We are built for the encouragement and life-giving strength of community. Community is the environment where all of the practices have the biggest impact. Worship and hospitality, for example, have an innate community aspect. Accountability happens only in the midst of deep friendships. Even rest or devotions, which seem like solitary endeavors, are more consistent when they are reinforced by a community that collectively encourages these practices. Are you rooted as a member in a local congregation, engaging in communal liturgy, sacraments and accountable relationships? There are three primary areas of life where we are called to serve and bring renewal. As Christians, these callings both serve as the result of Christian formation and the place of ongoing deeper formation. We are sent into every relationship — family and friends — for evangelism, reconciliation, and love. We can see our work as a context to fulfill God’s purposes for us and to join in cultural and gospel renewal. Where we live is a place to root ourselves and invest — to be neighbors advancing justice, compassion, and mercy. 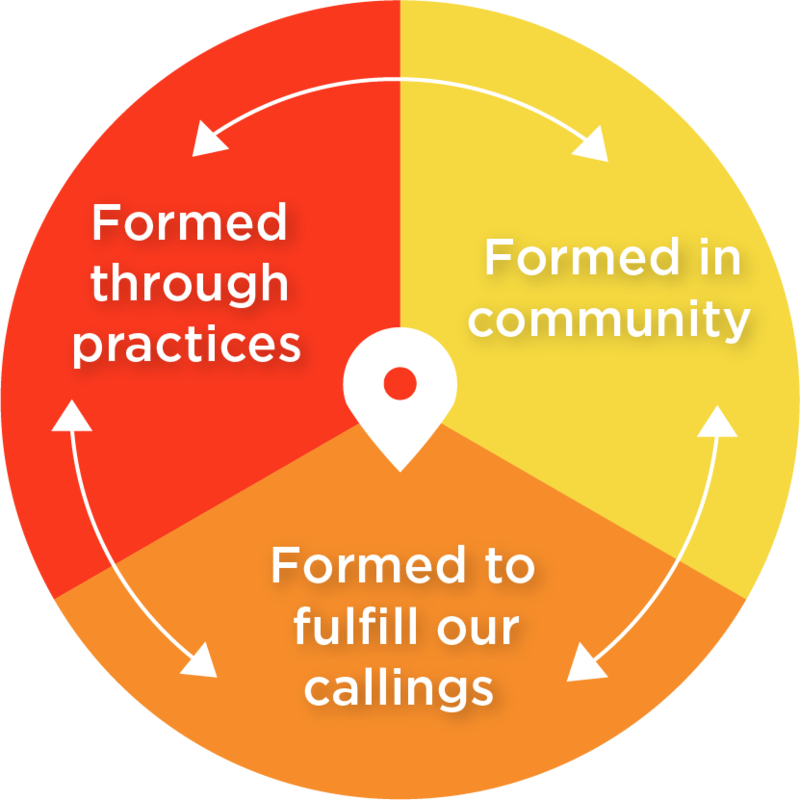 Are you fulfilling your calling in the areas of relationships, work, and neighborhood?